Haiti once a brilliant star in a foreign empire is now the poorest of the Western hemisphere nations. Through a legacy of colonialism and de facto colonialism the land of Haiti steadily degraded to where the rock could be seen beneath the soil. Where 98% of the forest had been destroyed more topsoil is taken out to sea every year. At the same time an increase in sea surface temperature has exacerbated the situation by increasing the destruction of storms every year. the last four years saw grave destruction for the people of Haiti. Mudslides, floods, wind damage and disease have left wanting. The situation has made many have to decide to leave the country. With their homes destroyed they leave to search for a better life. They are environmental refugees. They are forced into bad areas due to economic and political persecution where their environment is unable to sustain human activity. The destinations Haitians move to mostly are the US, Canada and other Caribbean Islands including the Dominican Republic, the Bahamas and Cuba. One finds the conflict with the immigration fo the Haitians to these new environments. The conflict arises because they do not assimilate, they retain their heritage and their national pride. They have become a transnational entity. There is a possibility of new conflicts in the field of transnationalism and environmental refugees, where the political and the social and separated, the people remain loyal to the nation, but not to the state. Haiti was the jewel of the French Empire during the 18th century, treasured for its lush forests. Times have changed however and after two centuries as an independent state forest cover is now less than 2% of Haiti's land. The remaining forest is being cut down at a rate of 4% per year. Deforestation has left Haiti with a soil erosion problem made worse by hurricanes and severe storms which lead to floods and mud slides caused by steep slopes. The United Nations estimates 50 percent of the country's topsoil has been run off into the ocean, making it unreclaimable for farmland. Haiti has experienced high rates of population growth at 2.3% in 2006. And with 60% of the population engaged in agricultural production the decrease in productivity has led to a decrease in incomes and increased poverty  . With the loss of topsoil a disturbing trend arose in Haitian economic geography, the move from subsistence farming to the harvesting of trees for fuelwood and production of charcoal. The farmland was no longer productive so people switched to harvesting the forests, causing more destruction of natural watersheds and increasing the soil erosion. As branches and trees have become less and less available Haitians have begun using roots, twigs and stumps as fuel. The removal of stumps and roots ensures trees will not grow again and leaves the topsoil exposed. The use of biomass is the biggest source of energy for Haiti. The charcoal and fuelwood industries are very important to the people's livelihood, but the practice is not sustainable . In the mean time, fuelwood meets 70% of energy needs. The emergence of an energy industry began in the 1940's and 50's in Haiti, so it is a relatively recent phenomenom. The use of the forests has spread in a matter of ten years. 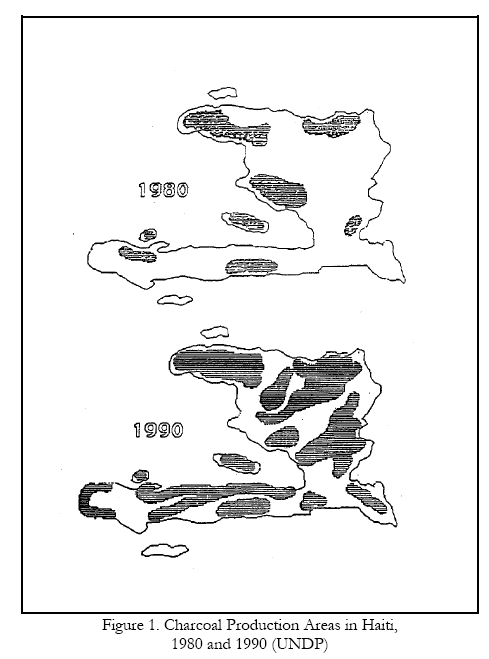 The image below shows the spread of charcoal production between the years 1980-1990. The increase in the fuel industry has exacerbated an already fragile environment. Crucial watersheds are destroyed leaving the land naked to destruction by storms which are becoming stronger every year. Since so many people depend on agriculture for subsistence it is important for the security of the country. One-third, approximately 28% according to the CIA, of the land is considered suitable for farming. Much of the land being farmed is considered unarable. The recent refugees coming from are Haiti are not political refugees, but are environmental refugees. The refugees arriving into the United States are being pushed by environmental degradation, not pulled by economic opportunity. An estimated 1.3 million people or 20% of the population have left the country, and 300,000 of them have left for the United States. These refugees are a new category in the 21st century, the environmental refugee. A measure of stability has reached Haiti and the violence subsides; however, the refugees, known as "boat people", continue to arrive on the shores of the United States, citing the reason why they are not merely political dissidents, but environmental victims . The chain of events has contributed to Haiti being the poorest nation in the Western Hemisphere: First there was deforestation caused by large the building of large plantations. Increased deforestation occurs because of the emergence of a fuel industry. Biomass has always been the primary source of fuel for Haitians. The environment is very steep, so run off increases; furthermnore, the increase in rain and severe storms has led to more run off and mroe soil erosion. Then the land becomes less productive, so people look to the fuel industry to supplement their income. This is not a sustainable system of living. The trees will be gone someday. Haitians led the only successful slave rebellion in the New World. They overthrew the French authorities and became second Republic in the hemisphere and the first Black Republic. 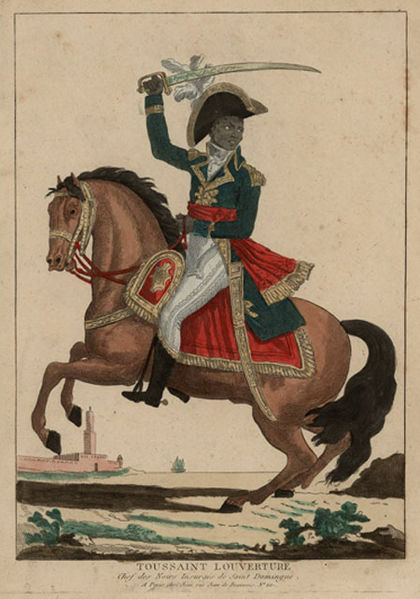 Led by Toussaint L'Ouverture, the blacks felt spurned by the French because they did not apply in the French slogan of Liberte, Egalite and Fraternite. Upon gaining independence in 1804, the Haitians were still not safe. French warships still caused anxiety about Haiti's security especially their threat of reinstituting slavery. The former slaves held for 21 years until they reached an agreement with France in 1825 to pay them for their independence. Upon the agreement they would finally be recognized as a member of the international community as well. The reparations in which the Haitians were made to pay were enormous and sometimes were 80% of the country's revenue. It is estimated $21 billion dollars in current income. So almost all resources were funnelled to paying the debt to France for more than a century. The Haitians cut down forests selling the tropical hard wood for the production of French furniture. The debt was finally paid off in 1947 . Forestry continued with the trees being made into charcoal instead of furniture. The French aided in creating a culture of deforestation that has left the land degraded, more vulnerable to natural disasters than any other Caribbean nation. Studies linking the frequency of hurricanes and global climate change has been rebuked. Multi-decadal fluctuations and the phenomena such as El Nino are blamed for the difference in frequency of hurricanes over time. The 50's and 60's saw an upswing in the amount of hurricanes, while from the 70's to the 90's there was a decrease in hurricane activity. The current decade is but another shift in the frequency of hurricanes. The 2005 season was the most intense hurricane season on record. There was a record 27 named storms and 15 hurricanes. Four of the 15 hurricanes were category 5 storms. This season also included the most intense storm on record, Hurricane Wilma . The intensity of hurricanes is what is most disconcerting and Kerry Emanuel of MIT has found proof of a link between increased sea surface temperatures and the intensity of hurricanes. The Atlantic ocean acts as an engine for stronger storms coming off the coast of Africa. One finds the intensity of the storm to be the most important factor when deciphering how global warming will affect our lives. The intensity has been shown to create the costliest storms in the last ten years. The frequency of storms effects the agriculture and way of life, but it does not create the destruction in which an intense storm can destroy capital and kill people. The best example would be of the category five hurricanes which hit New Orleans consecutively, in Katrina and Rita. Emanueal finds a correlation between increased Sea Surface Temperature and the Power Dissipation Index. The spreadsheet containing his data is contained in this linkunder excel spreadsheet: SST vs. PDI . The result of storms becoming stronger is more damage. They will also last longer because as the intensity rises the storm takes longer to gain strength as well as lose strength. As said earlier the ocean acts as an engine for tropical storms and the emission of greenhouse gases into the atmosphere has heated up the oceans. Thus the warmer the ocean is, the more powerful storms there will be. The refugees arriving from Haiti are environmental refugees. They are victims of global warming because they suffer from the effects of stronger hurricanes. Norman Myers opened people's eyes to the new refugee situation in the world at the 13th Economic Forum in Prague. He expressed a need to form a new paradigm for refugee status. There were people in the world who were forced to move from their homes because of either drought, desertification, soil etc. They could not eek out a meager living any longer, so they were forced to migrate. In 1995, there numbered 25 million environmental refugees with the amount climbing fast. Most of the refugees are from developing countries. The main crossing points are between Latin America, specifically, Mexico and the Caribbean ,and the United States and Africa, specifically the Sahel region and Europe. Where the developed countries must be concerned with is the cost of assimilating them into their countires or repatriating the refugees to their former countries. Most nations have restricted immigration in recent years bringing more strife to environmental refugees and have decreased foreign aid. He ends with a call to plant trees to improve the environment . Developed countries are responsible for the plight of refugees. They have created untenable situations through carbon emissions creating global climate change. The environment need to be recognized as a legitimate reason for emigration. The plight of developing nations with fragile environments is greater than developed nations; therefore, the damage inflicted by extreme events is much worse in a place like Haiti. Environmental refugees are sometimes not allowed to stay in foreign lands because their situation does not warrant refugee status. Andrew Simms of the New Economics Foundation in London, England says the term "persecution" should be applied to environmental persecution whereby people are "forced to live in worsening poverty on land that without warning could flood, or turn to dust." The best and most appropriate example of environmental persecution occurred in the United States during the 2005 hurricane season. Hurricane Katrina was an excellent example of how the global increase in ocean temperature had strenghtened hurricanes. In fact, two category 5 hurricanes landed on New Orleans, Katrina and Rita. Most of New Orleans is below sea level. A series of levees, canals and pumps are used to control the flooding of the city during heavy rainfall. 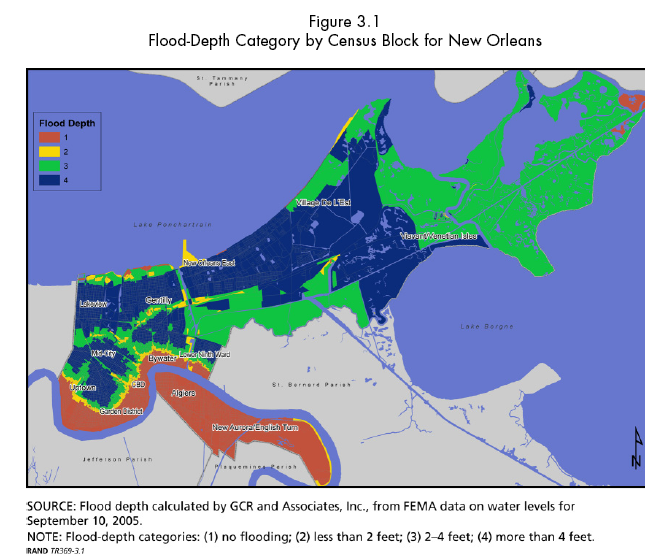 The levees were predicted to not be high enough to protect the city. The storm surge was predicted to be 28 ft., the levees were made to protect against a category 3 hurricane. The authorities knew there would be an enormous loss of life, so they called for an evacuation of the city; however, 25-30% of New Orleaneans did not possess vehicles. And municipal officials were not prepared for the disaster leaving many stranded. So, many New Orleans residents who were poor, infirm, elderly, or disabled were left to fend for themselves . In the end, there were 1.5 million people displaced, 200,000 homes destroyed and 81,000 businesses affected. Forty-four percent of the people who migrated to Houston said they would not return to New Orleans. This is the first large group of environmental refugees in the US. It was costly politically because it enlightened many to the economic and social inequalities which have been gaining in American society . The people affected the most were the African-American community for they made up 70% of New Orleans population. The devastation was a reminder of the legacy of the economic persecution blacks have faced. They had been hurded into the lowest sections of the city whereby they would be hurt most if the levees were to break. The death toll was purported to be around 1,300, but more was predicted because of the amount of missing persons reports . Moreover, a large refugee community exists, 240,000 refugees went to Houston, Texas or other close cities while another 60,000 have gone to places more than 750 miles away. The US Census put the population at 484,674 in 2000, but by January 2006 the number had decreased to approximately 200,000 as much of the population was forced to relocate due to the destruction . The convenience of not naming environmental refugees releases states from any responsibility for their situation. The people of New Orleans were environmentally persecuted because of their class. They did not have adequate safety from natural disasters. Where much of the inner city was populated blacks and much of the suburbs were populated by whites. The de facto segregation underscores a legacy of racism that persists until today. The image below shows the where the highest waters were in the city. This correlates with the districts heavily populated by blacks. On pages 14-15 of "Mapping Hurricane Katrina with GIS" one can find the information for the population of blacks and of whites. The people of New Orleans become some of the first US environmental refugees of the 21st century. It was the state's responsibility to protect the people and it failed miserably. Haiti disproportionately suffers the affects of disasters. 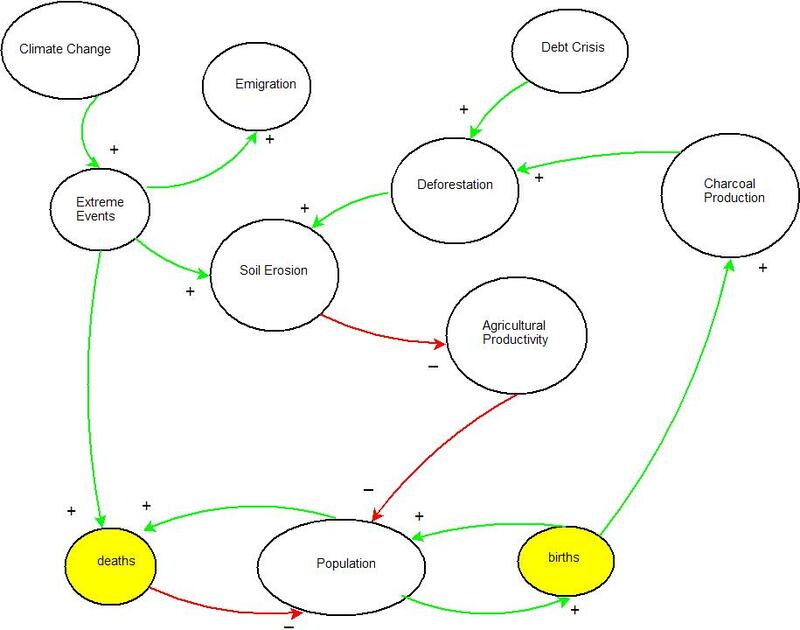 There is a direct link between casualties and deforestation which provides direction for future development policy in developing nations and specifically in Haiti. The conflict will be generational as the effects of global climate change are not fully known. The conflicts will be within Haiti with internally displaced persons, and between Haitians and foreign nations specifically the Dominican Republic, Canada and the United States. 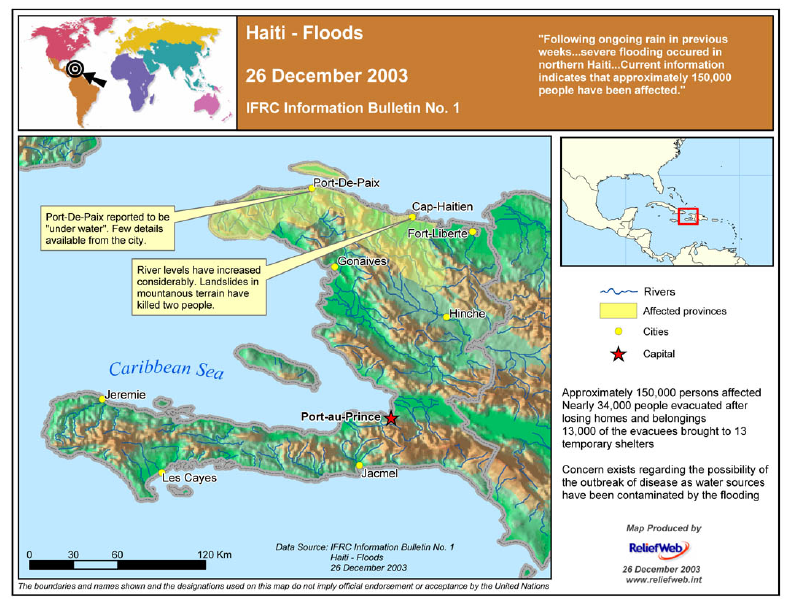 Floods hit the Northern part of Haiti in December of 2003. 150,000 people were affected by the flooding. The city of Port-de-Paix was left underwater. The yellow shaded areas are the areas affected most. An example of a current distater displacing many people was the 2004 hurricane season. Specifically Hurricane Jeanne hit Haiti directly causing mudslides and floods. What is a nuisance for a developed nation becomes a catastrophe to a developing nation. The city of Gonaives was devastated by Hurricane Jeanne. The high price of oil and deforestation makes Haiti especially susceptible to natural distaters. The waters rose to 4 meters or more than 12 feet in the center of Gonaives, forcing people to seek safety on rooftops . Three thousand lives were claimed by the floods and 200,000 people became homeless. What ensued was a hunger crisis, whereby some did not eat for three weeks after the storm . The following year hurricane Dennis hit Haiti as well as other Caribbean nations. This time southern Haiti was effected including the capital Port-au-Prince . Twenty -nine people were killed and nearly a hundred homes were destroyed leaving 500 people displaced. These numbers pale in comparison to the previous year, but still create instability among an already chaotic situation. 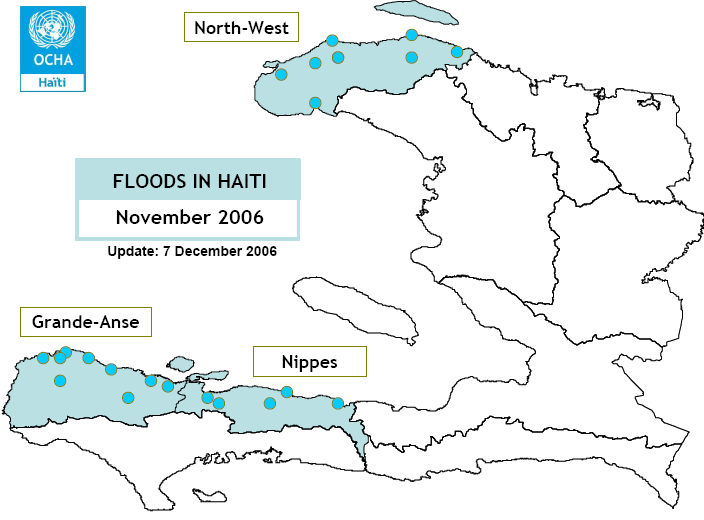 The floods of 2006 affected three principle areas, Northwest, Grande-Anse, and Nippes, Haiti. Seven people died and 317 homes were destroyed. The yearly destruction of powerful storms takes a toll on the people of Haiti. There is no coincidence that the most affected regions have been the North West province and Grand-Anse for they produce the most charcoal according to figure 1. The land of Haiti is mostly mountainous. With a lack of plains for arable farming the colonizers cleared the forests to build large plantations. Most of the topsoil for farming washes into the ocean. The deforestation is a cause of the soil erosion which leads to desertification. This is experienced most in the Northwest of the peninsula where the poorest reside . The extreme events will take place in Haiti. The environmental refugees will look countries like the Dominican Republic, the United States and Canada. They have and continue to find conflict and resistance. The conflict will resound between Haitian migrants and the US, Canadian, and Dominican government officials. As Haiti's environment becomes more degraded and the assistance continues to be neglible, Haitians will continue to migrate. The situation will be furthered by the powerful storms which yearly devastate the fragile economic, social and political life of Haiti. The immigration policies of each country, specifically the United States, will be an important factor in the coming crisis. Up until 1980, the US immigration policy was directed by a Cold War paradigm. Ninety-five percent of the refugees admitted into the country were from Communist countries, others asking for asylum were denied . The Mariel Boatlift, whereby 130,00 Cubans and 30,000 Haitians set off from Mariel Harbor in Cuba for Miami. An act of defiance by Fidel Castro, the Boatlift was mostly thought of as an attempt for Fidel Castro to ship all dissidents, criminals, homosexuals and other groups he did not desire to the United States. The Haitians were let in by the Cuban-Haitian entrants status program . The Attorney General was given the power to admit the Mariel Boatlift refugees . They considered most Haitians to be economic migrants, but were compassionate to their situation. The Reagan administration switched policy positions and signed an agreement with the dictator of Haiti, Jean-Claude "Baby-Doc" Duvalier for the interdiction of Haitian ships. The Coast Guard was allowed to board Haitian ships and interrogate the passengers. If they were found to be undocumented Haitians they would be returned to Haiti. 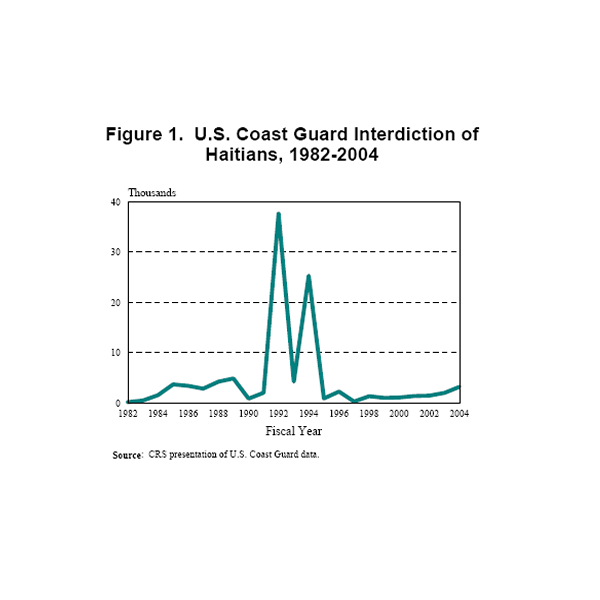 Between 1981-1990 22,940 Haitians were interdicted. The Immigration and Narualization Service (INS) decided only 11 were worthy of asylum. A new "Haiti program" was started as well with the agreement. The program's goal was to expedite the process of Haitian asylum seekers. They were denied access to lawyers to stop any claims for asylum. Any Haitian who made it to shore would be put in one of the different detention centers in Lake Placid, Big Spring,Texas, Fort Allen in Puerto Rico or Krome, Florida . Looking at the graph, the amount of interdictions should correspond with roughly the amount of Haitians migrating. The spikes are responses to actions on the ground. Which Jean Bertrand Aristide was elected the amount of interdictions decreased as stability was brought to the country. The 1991 coup spikes interdictions in 1992. There is another spike in 1993 as economic sanctions are imposed on Haiti's military government. A few years of stability mean interdictions decrease with the administration of Rene Preval. They go to the lowest in ten years in 1997. The interdictions spike once again during the 1998 Hurricane Georges natural disaster. They start to increase in 2003-2004 due to the coup and then Hurricane Jeanne. President evolved the policy of interdiction by not demanding interviews of the refugees on the ship. They could be repatriated without deciphering if they had a credible fear of return . He continued Reagan's policies but found some obstacles as the Supreme Court found it unconstitutional to deport the Haitians without due process. The executive decision was to transfer the refugees to Guantanamo Bay and interview them to see if they were being politically persecuted . This was called asylum, for the need to be in accordance with international law, but the truth of the matter was quite different. Two thousand Haitians were detained in the Krome detention facility for more than a year without due process. Even in the crises of 1992 and 1994, where we find a notable spike in Haitian emigration. The Haitian army began a reign of terror among the citizenry killing crucial backers of Jean Bertrand Aristide. The violence was led by a general, Raul Cedras who was the leader of the 1991 coup. He was found to have attended the School of the Americas which is a training ground for soldiers from foreign countries run by the CIA. He was also linked to the CIA during the coup, sparking accusations of collusion between the Haitian military and the United States in the overthrow of Aristide . Through pressure groups, limited reform did occur in the Clinton adminstration. In1994, an in-country asylum processing station was set up in the capital, therefore eliminating the sea as an obstacle for obtaining asylum . Also, the Haitian Immigration Fairness Act was written into law in 1998, whereby those Haitians living in the United States since 1995 could apply to be permanent legal residents . - State Department supports policies of return because it sees no history of repression in Haiti. - Asylum seekers were to be detained while their claim was processed, this policy was exclusive to Haitians. - John Ashcroft decided immigrants could be jailed if they constituted a national security risk . The national security risk was taking away resources from the Coast Guard from fighting the War on Terror. -The policy of interdictions at sea continues unabated. The Democratic administrations of Jimmy Carter and Bill Clinton saw a loosening of regulations and injustice concerning Haitian environmental refugees. The Republican administrations beginning with Ronald Reagan's deal with Baby Doc Duvalier to allow interdictions began a trying time for Haitian migrants. George H.W. Bush began keeping migrants in the Guantanamo Bay detention facility as well as other holding centers throughout the United States. And finally George W. Bush has made the policy a national security issue. Interdictions take resources away from the Coast Guard from fighting the War on Terror and Haitians should be deterred as much as possible from making the boat trip to the Florida shores. There is a forseeable threat of conflict between the country of Haiti and the United States government. It is what some have come to call climate justice, the disasters which usually affect Haiti every five to ten years are becoming more frequent and much deadlier. When Haiti asks the United States to pay for the damages done to its infrastructure after one of these disasters the response will most likely be hostile. Recent developments in communications and society have strenghtened the ties between emigrants and their homes. The recent idea of climate justice and success of peoples who have left their poverty stricken homes point to the fact some of the problems may be environmental. Instead of embracing a new state, Haitians have formed a transnational state whereby remittances are equal to a quarter of Haiti's GDP, $1.65 billion in 2006 . Remittances are the source of many Haitians subsistence. About 1.3 million Haitian live outside with the United States being the most common destination. Big centers of Haitian settlement are in New York and Miami. Haitians especially come to America with an already developed identity. Known as the first Black Republic in the world they are proud of their heritage. They have found ways to differentiate themselves from African-Americans, the groups with whom most would identify them. The population has found a way to identify as being American and Haitian . The issue has been small, but if a horrific event occurs, it will spark the energy needed to create change in the immigration policy. The Haitian diaspora has not been able to exact any significant change in US policy so far. The conflict level is threat. This does not include the people dying in hurricanes or mudslides. The oncoming conflict will be between Haitian refugees and the United States as well as other developed nations. They will call for climate justice. The deathtoll will be somewhere in the thousands as the Haitian "boat people" attempt to travail across the Gulf of Mexico into the United States. The issue of climate justice and environmental refugees are becoming pivotal subjects in the international arena. Countries of the Global South are looking to the Indutrialized Nations to take responsibility for the current and future changes in the environment. One predicts a disaster unless developed nations begin to invest heavily in developing nations. Current amounts fall short of development goals. US interdictions are illegal and should be stopped immediately as well. This case is the most similar case in the environment and conflict database. This case acts as an expansion upon this original csase talking about the deprivation of Haiti because of deforestation. It adds elements of colonialism, climate change and US immigration policy. We find resource scarcity in other areas of the Caribbean. If the whole area is suffering from a lack of resources they should become more organized in specializing in certain areas of production. A lot of information is mising from this case which does not allow my analysis to go any further. Economic sanctions seem have enhanced an already deteriorating situation in Haiti. The United States is worried about Haitian immigration, but it increases the amount of poverty and thus the amount of immigrants by putting sanctions on the government. Economic sanctions should not be the answer. This case is similar because it involves two North American countries. We see how the relations between two countries can affect worldwide policy practices. Immigration policy towards Haiti is watched by other Caribbean nations, and the US is criticized because of an imprudent law. The Congo is a country which is a former colony like Haiti. It has experienced great internal strife because of the conflict in Rwanda during the 90's. This is important for US policy, with environmental conflict in other countries, there is a likelihood they could spill over into the United States. The solution would not be to deport however. They must look for other solutions, like assimilation and processing stations in Haiti. 3. Lea, John Dale. "A Review of Literature on Charcoal in Haiti." South East Consortium for International Development USAID Haiti Productive Land Use Systems Project. Prosopis Wokshop (13-15 March 1996). 5. Philips, Anthony and Brian Concannon Jr. "Economic Justice in Haiti Requires Debt Restitution". IRC Americas Program. 7 Sept 2006. 20 March 2007. 6. White, Anderson. "Policy Lessons from History and Natural Resource Projects in Rural Haiti". Working Paper no. 17. USAID. (November 1994) 1-58. 7. Climate of 2005 Hurricane Season. 21 August 2006. 12 March 2007 (National Climatic Data Center) < http://www.ncdc.noaa.gov/oa/climate/research/2005/hurricanes05.html >. 8. Emanuel, Kerry. "Increasing Destructiveness of Tropical Cyclones Over the Past Thirty Years." Nature. no.436 (4 August 2005) 686-688. 9. Myers, Norman. "Environmental Refugees: An Emergent Security Issue." 13th Economic Forum Prague 23-27 May 2005 . 22 May 2005. 10.Wilkinson, Ray. "Should Environmental Migrants be considered Refugees?" Refugees no.127 (2002) p.12-13. 12. Waugh, William L. "The Political Costs of Failure in the Katrina and Rita Disasters." The Annals of the American Academy of Politcal and Social Sciences. (2006) 604, 10-25. 16. Anonymous. "Hurricane Dennis leaves trail of destruction in Cuba and Haiti." Catholic Relief Services. 11 July 2005. 15 March 2005. 17. Shellman, Stephen and Brandon Stewart. "Political Persecution or Economic Deprivation: A Time Series Analysis of Haitian Exodus, 1990-2004". 19. Wasem, Ruth Ellen. " US immigration policy on Haitian migrants". CRS report for Congress. 21. Anonymous. "Remittances to Haiti topped $1.65 billion in 2006, says IDB fund." Inter-American Development Bank . March 5, 2007. 22. Glick Schiller, Nina and Georges E. Fouron. "Terrains of Blood and Nation: Haitian Transnational Social Field." Ethnic and Racial Studies. (March 1999) 22 no.2 p.340-366.